Kids always love counting down to some big event in their lives, and my big kids are no exception. 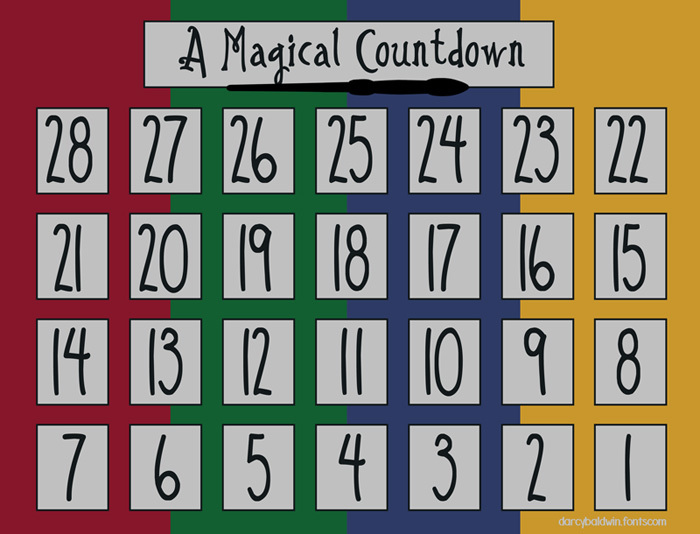 When our family decided to go on a trip to The Wizarding World of Harry Potter for our first ever family vacation (we’ll actually see all the rest of Universal Studios, too), they loved having a visual reminder each day of those last few weeks to count down, so I created this printable. After sharing it on a planning site that I used, I decided to post it here so that anyone can grab it if they can use it! It’s great for birthdays, too! Note: This image is sized 8×10.5 to fit on an 8.5×11 sheet. I suggest printing on cardstock to keep a permanent marker from soaking through so easily. Alternatively, you can frame it and use a wipe-off marker on the glass to get the same result. You’ll just have to trim the edges a bit. Have fun on your trip — or your birthday party — or whatever other big plan you have!